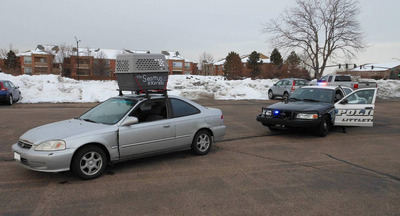 A car with a dog kennel strapped to its roof was pulled over earlier this week in Littleton, Colo. by police. Fortunately, a stuffed animal was found inside the dog carrier – not an actual dog. The driver of the two-door Honda was cited for failing to provide proof of insurance. He was initially pulled over for suspicion of animal cruelty after a motorist spotted the vehicle and called 911. “The Seamus Express” was written on the side of the carrier – Seamus was the name of Mitt Romney’s Irish Setter that the presidential hopeful transported via such a carrier in a 1983 road trip. The driver of the vehicle is a so-called Pack Member of Dogs Against Romney, a website that was founded in 2007 and devoted to exploiting the 1983 Romney-dog incident.